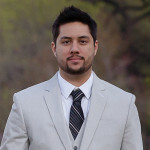 With the recent release of vSphere 6.5, I needed to upgrade my lab environment and figured I would write a post to help others who may need step by step guidance on the upgrade process. I am currently running NSX 6.2.2 with vCenter Server 6.0 and will be upgrading to NSX 6.3 with vSphere 6.5. Since NSX 6.3 is the only release that currently supports vCenter Server 6.5, I will need to ensure that I upgrade NSX to 6.3 before vSphere, otherwise I will be in an unsupported state (Can’t run NSX 6.2.2 on vSphere 6.5). If there are ever any questions about what platforms and solutions are supported as well as versioning, you can visit the page below to check the Product Interoperability Matrix. The same link also provides an upgrade path. A few items to be aware of before starting the upgrade. If you are using data security, ensure you uninstall it before attempting the upgrade as it has been deprecated in NSX 6.3. This will be the first part of a three-part series and I recommend that all steps be completed during the same maintenance window. Let’s get to it. The first step is to download the NSX Manager upgrade bundle. You can do so if you have entitlement via the link below. Once you download the upgrade bundle, you can log into the NSX Manager GUI by accessing the FQDN or IP of the appliance via a browser. Once logged in, navigate to Manage -> Upgrade and select the Upgrade Button. Note: In order to save time from having to upload the upgrade bundle twice, please make sure that you take a backup of the NSX Manager via the Backups & Restore link. A warning screen will pop up as soon as the upload is complete, warning you to ensure to take a new backup before proceeding. If you haven’t taken a backup, you have to cancel and start over. Please don’t take this lightly, I would definitely recommend that a backup is in place before moving to the next step. Once you have created the new backup, click the Upgrade Button, select the file, and go grab a cup of coffee while you wait for it to upload. Once you are ready to start the upgrade, go ahead and click the Upgrade Button. My upgrade only took about 5 minutes, and I had to log back into the browser to see it complete. It’s also best practice to log into vCenter Server and restart the Web Client. I have completed that via an SSH to the VCSA using the commands below. Finally, make sure to create a new backup of the NSX Manager. Since the upgrade complete successfully, the backup is no longer valid since it’s a different version. We will be upgrading more components so it’s best to take the backup before moving on and completing any more steps. As mentioned, I advise that all steps be completed in one maintenance window as it’s not supported to be running mixed versions of NSX Manager, controllers, edges, host clusters, etc. To continue to the next step, please see the post below. we have an infrastructure with vCenter 6.0 U2 + external PSC 6.0 and NSX 6.2.2. I know that before upgrade NSX to 6.5 , you must update external PSC to 6.5 first, right ? 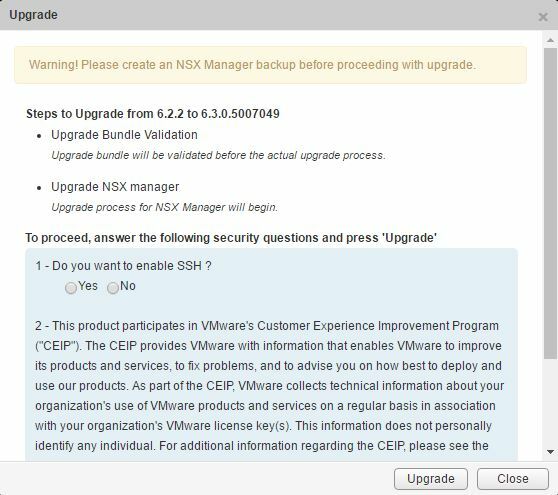 Can you upgrade NSX to 6.3 without upgrade external PSC to 6.5 ? Can I upgrade external PSC to 6.5 and remain vCenter in 6.0 U2?